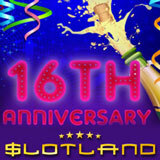 Slotland was one of the very first online casinos and has always been a personal favorite of mine. I'm just shocked to learn that it is celebrating its sixteenth birthday this month. Wow! I can't think of very many online casinos that have been around that long! They must be doing something right! The unique casino is celebrating this major milestone with freebies, bonuses and new lower bets on eight favorite slot games. The birthday party is beginning with some birthday bonuses this weekend. Players are receiving up to $15 Free Chips by email this week and a 45% casino bonus will be added to all deposits (until Saturday, October 11, 2014). The unique casino promises more casino bonuses during the month and it's even possible that a new game will be ready to launch before the birthday party is over. Starting this week Slotland now has new low bet options on select games. On games like Fruit Mania, Pearls of Atlantis and Carnival, players can now get more playing time for their dollar by betting as little as five cents per spin. The other games with new low bets are Tikal Treasure, Golden 8, Magic, Halloween Magic and Lucky Stars. Max bets have not been changed. Recently, long-time players have been reminiscing on Facebook about Slotland’s pioneering early days. Even with all the more elaborate games Slotland has introduced since then, many say Jacks or Better or Booster were the first games they played and are still their favorites. Watch for additional birthday offers to be announced in player newsletters and on the casino Facebook page.